It was my intention for the museum and Csontvary's heritage - also according to his own last will – to locate the museum on a good accessible but also a natural spot in Budapest that can be reached easily by everybody, also by wheelchairs or with prams. I found right site in a forest on the Normafa hilltop, where the ridge is missing and there is no view now. Inspired by the genius loci the building rebuilds the missing ridge. As there is already an abandoned parking place on the spot – it wouldn't be necessary to cut any trees for the building. 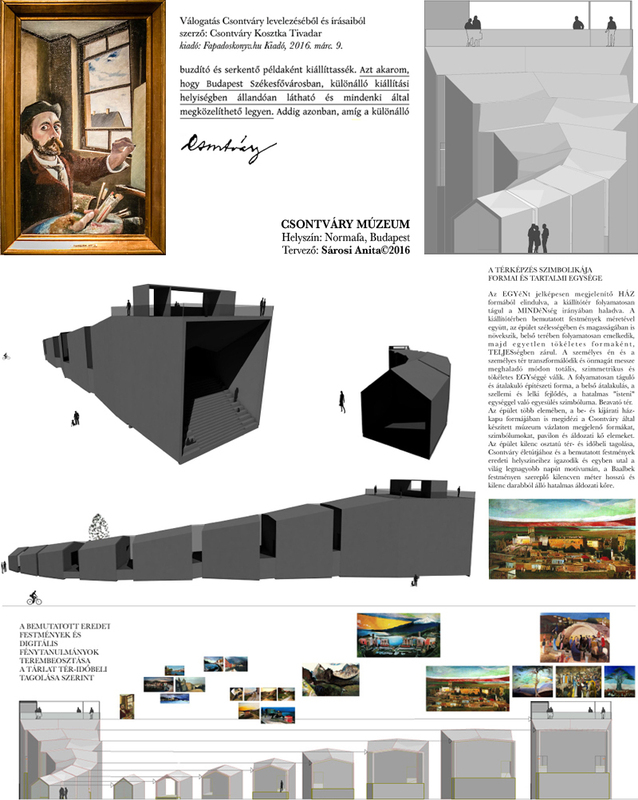 I designed a building made from concrete shapes of a backbone (Csontvary means translated = bone castle) with spaces that adapt to the sizes of the paintings, that rises about the town endowing the public with an incomparable view on Budapest. The interior is subtle, the grey surface of the concrete modestly serves the extraordinary richness of Csontvary's colors. My aim was to create an unpretentious building, which expresses the spirit of Csontvary. The outside of the Csontvary Museum is rising as a backbone from the hilltop; this has clearly functional and symbolic character. The museum cooperates with nature; it’s geo-, eco-sensitive; sustainable. It allows access, user-friendly with full runs 5% ramp; it saves, protects and transfers the heritage of Csontvary for the future. It would be the only one completely barrier-free viewpoint in Budapest; it incorporates a high point of view and gives a surprisingly broad perspective for everyone – like Csontvary. In view of the site selection, the harmony of the works of art and the exhibition halls, the exhibition conception of oeuvre, the jury has bought the project. The jury's reasoning: An outstanding, brilliant idea, the plan was made with amazing and simple tools. The creator takes advantage character of site and creates a special sense of space at the same time. Architecturally, its interior and exterior are fantastic. Indeed, it would be a truly unique place suitable for the Csontvary exhibition, as its creations require different size halls. Presenting the paintings and the entire dramaturgy of the exhibition, the internal operations - as they guide the visitors - are novel, poetic, exciting and interesting.